I’m going without diary products these days (Don’t ask why) and this was one of the first dishes that I made that I had to divide up the recipe: one part for me, and two parts for my fam. I could have everything in the wrap except the best part – the Caesar dressing! 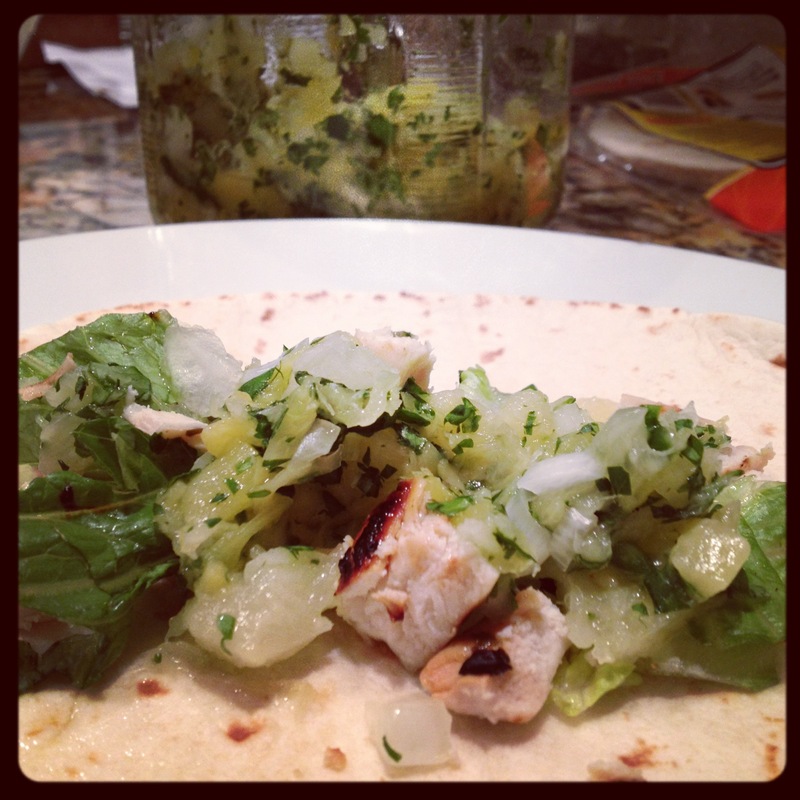 I tried to make up for it with the homemade salsa…you’ll soon learn why that didn’t work. But we all loved having the light meal on a hot night. See my notes below in italics. Stir together pineapple, onion, lime juice, cilantro and pepper in small bowl. Set salsa aside. Broil or grill chicken 10 – 12 minutes, turning once or until no longer pink in the center. Cool slightly; cut (love my kitchen scissors!) into bite-sized pieces. Toss salad greens with chicken pieces, grated cheese from packet and salad dressing. Reserve croutons to use in another salad (oops, left in, no one noticed). Spoon about 1 cup salad mixture into each tortilla, top with 2 tbspns pineapple salsa, fold sides over salsa. Serve with remaining salsa.